Professional tree trimming service from All American Tractor & Tree is a great alternative to completely removing a tree. Our expert arborists can remove problematic branches from your tree, saving the rest of it. If you have an unsightly tree on your property, one of our knowledgeable tree experts can give your tree the facelift it needs by shaping the tree into a more aesthetically pleasing form. 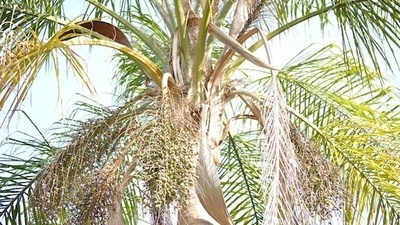 Tree trimming improves your tree in a targeted and detailed manner to increase the health, appearance, and safety of the tree. Tree trimming is both an art as well as a science. 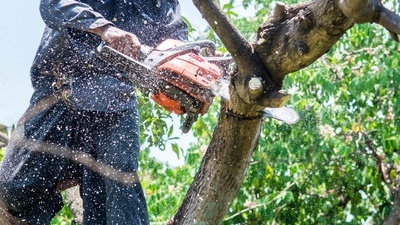 To make certain that your trees are pruned to the highest standards, we require each of our employees to be fully trained in proper pruning techniques and to be highly knowledgeable in tree biology. The benefits of properly pruned trees include vastly improved visual appeal but also increased safety and resistance to storm damage and a stronger defense against attacks by pests and pathogens. Poorly performed pruning causes permanent damage and hastens the decline or death of your tree. When you hire All American Tractor & Tree, you hire the tree trimming experts. We are licensed and insured, and have decades of professional tree trimming experience. Please contact All American Tractor & Tree today by calling (352) 460-1922 or by using our online contact form to learn more about tree trimming services. At All American Tractor & Tree, we handle all of your tree service needs including professional tree removal, tree trimming, tree stump grinding, tree debris hauling, and emergency storm damage removal. Tree services are dangerous jobs. There are many instances when a tree that needs to be removed poses a risk of damage to property or people. The hazards of climbing high up a tree with powerful saws and equipment and improper experience are not something to take lightly and can result in serious bodily injury or death. Are all tree service companies the same? Every professional tree service company is not created equal. All American Tractor & Tree has many years of experience that get us through even the toughest tree service jobs safely. 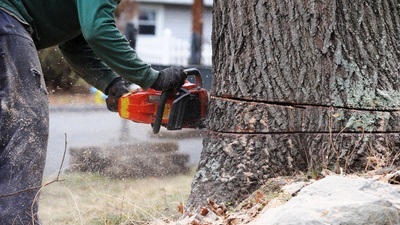 As with all service industries, there are fly-by-night companies or individuals with chainsaws that claim to be in the professional tree service business. Hiring unlicensed or uninsured tree service providers often results in damage to your property or unfinished tree jobs. Understand that claims made to save you a couple of hundred dollars on a less experienced tree service company can create problems that cost hundreds more to fix. We are the premier tree service company in the Lake, Sumter, and Orange County area, offering reasonable prices and excellent service. With the top tree service professionals in the industry, you can be sure you are receiving only the best service and support when it comes to your tree service needs. For the very best tree removal experts, look no further than All American Tractor & Tree. Please contact All American Tractor & Tree today by calling (352) 460-1922 or by using our online contact form to learn more about tree removal services. Old stumps are a pain. Stump grind those old stumps into mulch. 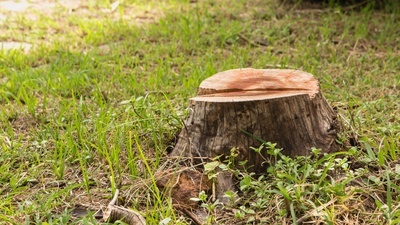 The sight of a stump on your property isn't an appealing one. If you are meticulous about your yard's appearance, landscaping, and safety - removing the stump is a must. Tree stumps pose a hazard in your yard for children playing and cause damage to lawn mowing equipment. Leaving an old stump can also lead to new tree growth. New sprouts will start popping up before you know it. Old decaying stumps attract insects to your yard. Stumps left in your lawn from decaying trees can take years to rot away completely. While it is decaying, the tree stump attracts ants, beetles, termites, and other wood-boring pests that can eventually spread to your home, causing highly expensive damage. Upon removal of a tree, you may choose to have the stump ground away on the spot. Stump grinding is achieved by using a high RPM stump grinding machine that processes your tree stump into beautiful wood chips which naturally return to your soil as mulch. Stumps are typically ground 8-10 inches below your existing soil grade. Root pruning is often a desirable additional service to stop the spread of troublesome roots near houses, fences or concrete. When you hire All American Tractor & Tree, you hire the stump removal experts in Central Florida. We are licensed, insured, bonded and have many years of stump removal experience. 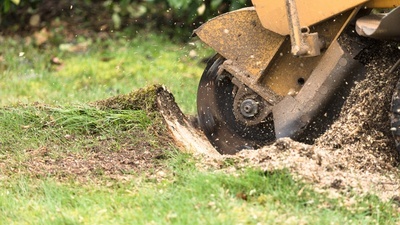 Please contact All American Tractor & Tree today by calling (352) 460-1922 or by using our online contact form to learn more about tree stump grinding services. While tree debris removal is an involved process, allowing leaves and tree limbs to lay on top of your lawn is harmful. Grass naturally requires plenty of sunlight, water, nutrients and oxygen to grow properly. When other materials cover it, your grass is unable to grow. Further, the presence of debris kills your grass in patches. If several piles of leaves go ignored, they become very wet and heavy and encourage the growth of fungus. Not only is an overgrown yard aesthetically displeasing, but it also harbors insects, spiders, and snakes that use the thick brush as cover. All American Tractor & Trees' tree debris hauling service eliminates any amount of yard waste. Whether it is a few piles of leaves or larger fallen branches or entire trees from storms - we restore your yard beautifully. Whether you have just purchased your property and need a complete overhaul or you only have a few things to clear out of the way, All American Tractor & Tree is here to get your lawn ready to soak in the sun and rain and grow to its full, beautiful potential. Please contact All American Tractor & Tree today by calling (352) 460-1922 or by using our online contact form to learn more about tree debris clean-up and hauling services. 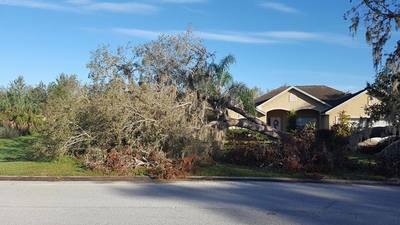 Thunderstorms are prevalent in Central Florida, and All American Tractor & Tree offers professional, emergency tree removal and storm damage clean up for fallen or at-risk trees on your property. With years of experience in providing emergency tree storm service, All American Tractor & Tree has the resources, equipment, and personnel to handle every type of tree removal. If a large tree has fallen on your home, car, or other property - contact us to have it removed safely. If you have large trees on your property that you feel are at risk for falling in a storm, or from saturated soil conditions, All American Tractor & Tree helps you prevent storm-related damage by removing, thinning or cabling your problem trees. We will evaluate the health of the tree, as well as the tree species, size, and location before offering the perfect solution for that tree. Homeowners are often unaware of the risks associated with defective trees on their property, and the potential financial liability for those trees should they pose a risk to other properties. Hazardous trees cause personal injuries, as well as property damage, and create enormous liability issues in court from preventable accidents caused by defective trees on your property. Identifying and recognizing potentially hazardous trees and taking proper preventative action protects property, saves lives, and helps protect you from legal issues. 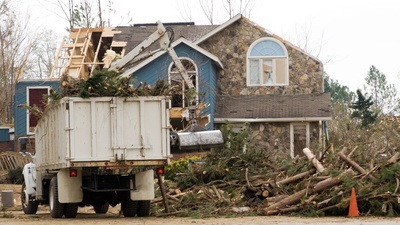 Please contact All American Tractor & Tree today by calling (352) 460-1922 or by using our online contact form to learn more about tree storm damage clean-up services. 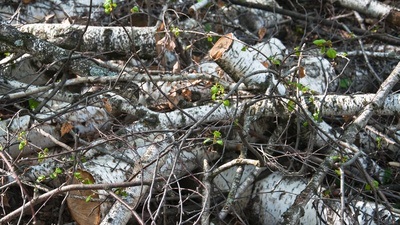 Doing yard work can leave you with piles of pruned branches and other debris. If you have a smaller yard, it can be tough to dispose of cuttings and brush on your property discreetly. All American Tractor & Tree is here to help. We've got the equipment, and the team to take care of your yard debris. Do you have a burn pile on your property that's been there for a while and you don't have the time to deal with it? Let us haul it away for you. Do you have a downed tree you don't have the right equipment to handle? Let All American Tractor & Tree take care of it. With our brush removal service, All American Tractor & Tree can help you keep your yard neat and looking its best. Please contact All American Tractor & Tree today by calling (352) 460-1922 or by using our online contact form to learn more about brush removal services.